The past seven days haven’t been the most memorable for Virginia trout anglers. Severe storms, heavy rain and wind kept many fishermen off their favorite streams for much of the latter part of the week, and more rain yesterday isn’t taking the pressure off the volume of water racing through these mountainous systems. We tried to fish the Maury River on Thursday and were faced with stained and torrent water. Many of the nearby streams, like the Jackson River, and just about every system in the region was raging. Fortunately, Douthat State Park’s Wilson Creek remained fishable. We decided to film Pautzke Outdoors here Thursday despite swift currents, slightly stained water and what some would contest as intimidating conditions. This normal slow meandering, easy to fish stream didn’t look like its normal self. Water gushed over the dam at Douthat Lake, tributaries flushed water out of the many canyons and gullies that dump into the creek and what were pools when I was here last April turned to fast moving runs. Meanwhile, those who know how to target trout in these conditions can still find success. In fact, between 10 a.m and 1:30 p.m. when we fished the section of creek below the dam, we caught and released several dozen trout, some up to four pounds. The key was employing salmon eggs in pockets, holes, current breaks and tailouts to pluck out trout pinned in areas where they could expend less energy and still feed. 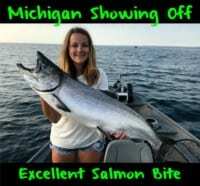 Using salmon eggs enables you to pluck baits in a concentrated area where trout will likely be and keep them in the strike zone, whereas lures and spoons would likely be swept downstream in the current. We spent our day flipping Silver Label, Gold Label and Yellow Jacket Pautzke salmon eggs on size 10 single salmon egg Gamakatsu hooks, with a single BB split shot and four-pound Trilene (fluorocarbon wasn’t necessary due to the slightly stained water). The Yellow Jackets yielded the most strikes, however, our pair of 3-4 pound fish came simultaneously on Silver Label and Gold Label eggs. The glittered eggs fared well. Wilson Creek is one of Bath County’s more popular systems, simply because how often it’s stocked and the public, roadside access available in Douthat State Park. Anglers can park alongside more than five miles of creek that’s stocked twice a week through June 15. The Virginia Department of Game & Inland Fisheries does a great job at loaded the creek with rainbows, which is necessary given the heavy pressure this system receives. Meanwhile, sizes vary. Of the several dozen trout we caught and released (we didn’t keep a single fish simply because we were traveling and didn’t have the means to eat them) most were small, by that we’re talking 9-10 inch fish. A handful were 10-12 inches and two breached several pounds. We conversed with a half dozen anglers who had limited success and a few fish on their stringers than were fewer than 10 inches. Surprisingly, we didn’t catch any brook trout. Last year, we only caught brooks here. Wilson should fish well this week and hopefully slowly recede. For now, however, I’d start up near the dam and work downstream, simply because the water is less torrent here. As you get downstream near the part entrance several tributaries enter and bring increased flows. The two culverts on the top end of the stream are harboring lots of fish right now and likely the easiest parts of the system to fish, simply because of the size of the pools, but they also come with crowds. Keep in mind, Douthat Lake is also stocked with trout. We couldn’t find a single person fishing for trout here or anyone at the park with knowledge of where the trout were biting or congregating. Consequently, we didn’t wet a line. 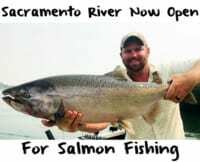 This will be a great resource for anglers who want to soak dough bait from the shore when better information is available. Editor’s Note: A fishing license and daily permit is required to fish the waters of Douthat State Park. 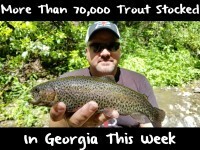 Trout are stocked two times per week throughout the fee period. A daily permit ($8.00) is required from the first Saturday in April through June 15 and from September 15 through October 31. From June 16 through September 14, no trout will be stocked and no daily fee or trout license is required. Fishing begins at 6:00 a.m daily. Anglers may keep six trout per day. A small “children-only” area has been established on Wilson Creek, just below the dam. There is a day use parking fee.